They are NOTHING ON THESE. Nothing at all, no thing has come before in my life, my life of brownies. Like mousse or truffles and hardly sweet, these little cubes melt away into midnight, and then the tongue meets the fruitful pearls, the rum flamed golden raisins! Just enough to keep the mind interested. Each crumb a universe of cocoa & butter, a mouthful in miniature, so intense these are! Smooth, crazy smooth, and more-ish like a gift. Okay I’m waxing poetic. But…. Dorie Greenspan makes that sort of thing necessary! I admit I initially skipped over the brownie section of Baking: From My Home to Yours (“not a brownie person”, remember?). 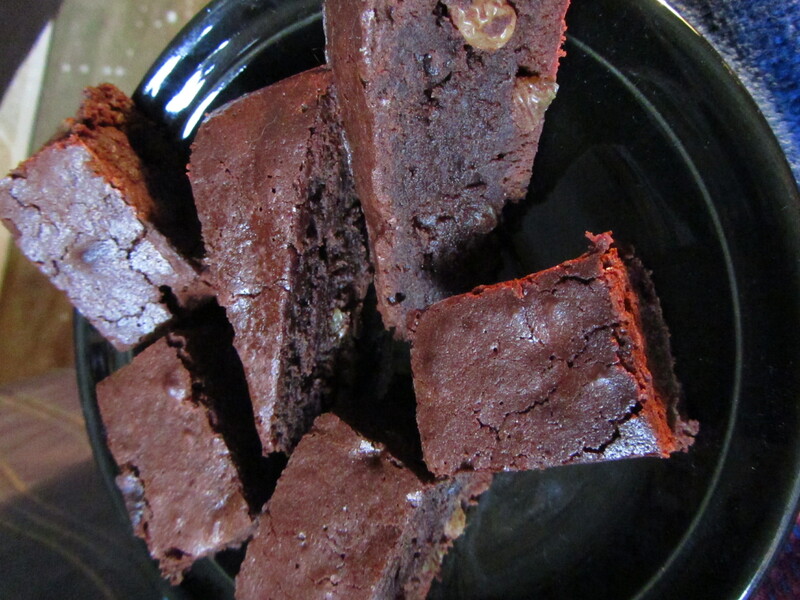 But upon recent perusal and upon recently dating someone who enjoys his chocolatey-chocolate, I quickly landed on the French Chocolate Brownie recipe. It’s apparently not even a brownie, not to the french, anyway. 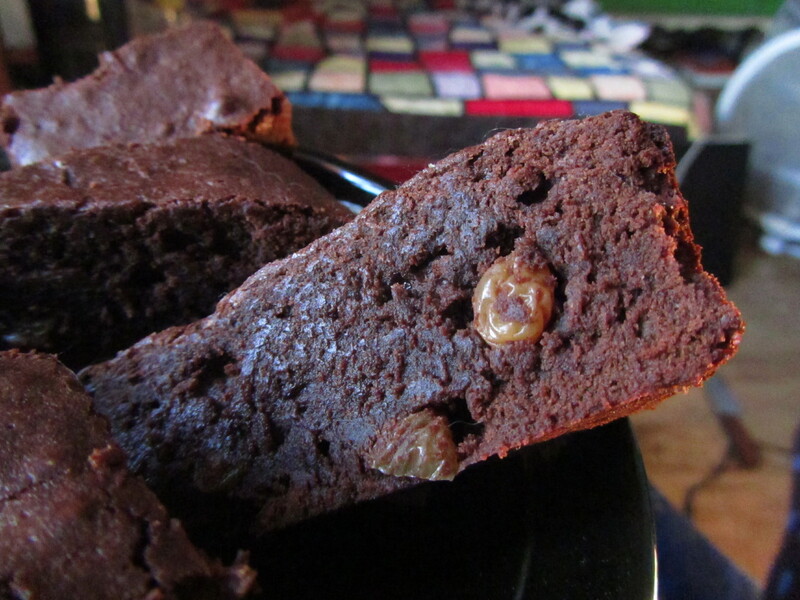 To them, this recipe is a fondant chocolat – a super soft and rich cake, just happening to be eerily similar (identical?) 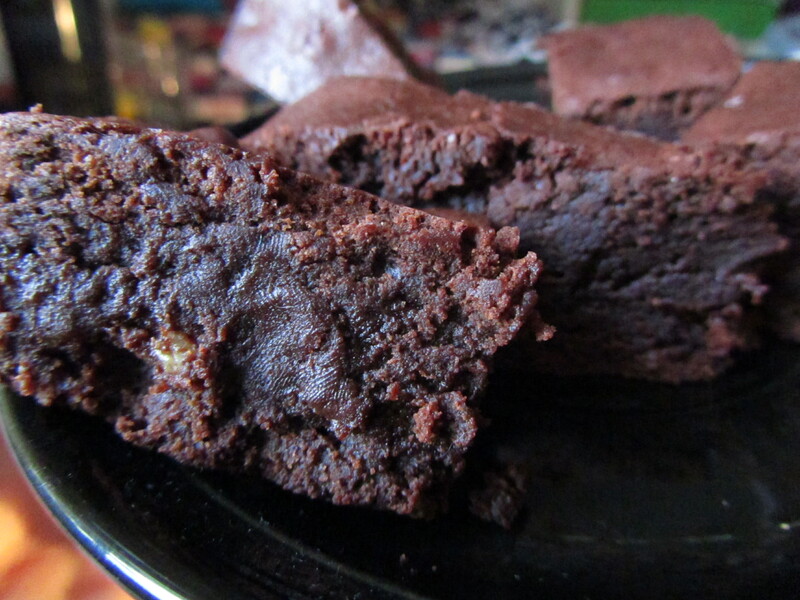 to the traits of the north american brownie. And when it comes to baking, I pretty much go “French? Mais oui! When have they EVER GONE WRONG MAKING PATISSERIE?”. Choice made and made. And so glad I did! I might have to try some of her other kinds now, too, though…….. now that the bug has bitten. Buzz buzz chocobugmothspiderpillarcocoafiendRARRRRRRR! 2/3 cup lightly toasted walnuts or hazelnuts (optional). Place a rack just below center of oven and preheat to 300 degrees. Line an 8-inch-square pan with foil and brush with melted butter. Put the raisins in a small saucepan with the water, bring to a boil over medium heat and cook until the water almost evaporates. Add the rum, let it warm for about 30 seconds, turn off the heat, stand back and flame the rum. When the flames have died, set the raisins aside until needed. Right before you’re ready to put the brownie batter in the pan, fold in the raisins. In a bowl, whisk flour and salt together. In top of a double boiler set over barely simmering water, or on low power in a microwave, melt remaining butter and chocolate together. Stir often and remove from heat when a few lumps remain. Stir until smooth. In a mixer, beat eggs and sugar together until thick and pale yellow. Add chocolate mixture and vanilla and mix at low speed until smooth. Add dry ingredients and mix 30 seconds, then finish mixing by hand, adding nuts if using. Pour into prepared pan and bake 50 to 60 minutes, until top is dry. Let cool in pan, then lift out and cut into bars or wrap in foil.